I am proud and excited to bring you our first “Guest Blog”. This is written by our good friend and mentor, Berna Welch. This is a story of heartbreak and grief and how friendship, kindness and a special Golden puppy brought happiness and joy in a very dark time. Sometimes people come into your lives and make an enormous impact. In my life, two wonderful women from Vermont did just that. 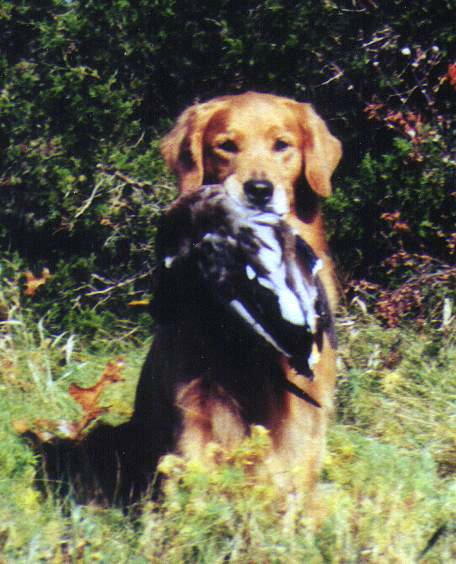 Kathy & Carolyn contacted me seven years ago about potentially breeding their female Golden Retriever, Skeeter, to our Travis. Kathy & Carolyn train their dogs in obedience, agility, tracking and just about anything else they can find the time to do. 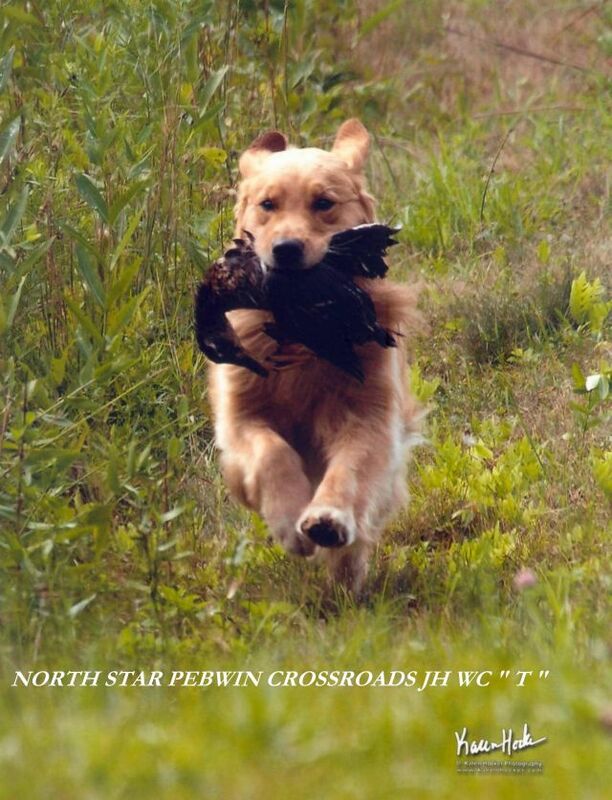 After carefully researching pedigrees and investigating various stud dogs, they asked about Travis, who was a champion with an obedience title and two hunting titles, as a possible choice to sire Skeeter’s litter. As luck would have it Peter and I had planned a visit with friends in Vermont a couple of weeks later so we invited Kathy & Carolyn to meet Travis while we were there. To know Travis was to love him immediately. His magnetic personality made him a favorite of all he met, human or dog, and Kathy & Carolyn were no exception. Meeting Travis sealed the deal and a rendevous was planned. 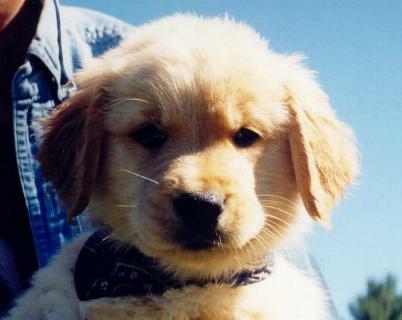 A short time later Skeeter was bred to Travis and gave birth to a litter of 9 puppies. Everyone was beyond thrilled. Skeeter brought great working ability to the pedigree as she was multi-titled herself. These pups would have great potential! When the litter was about 3 weeks old, Travis who was 8 at the time, had a grand mal seizure. It was an extremely hot/humid August day and his temperature was dangerously high. We immediately cooled him down in the tub and called our vet, took him for bloodwork and observation and put him on a mild dose of phenobarbital. All tests were negative but a few days later he seizured again. This was followed by a nosebleed…not a good sign at all. One week post the first seizure, Travis died on his bed in our kitchen. The diagnosis was likely a rapidly growing brain tumor. No words could adequately describe our grief. I knew I must contact Kathy & Carolyn to te ll them the awful news. I simply could not speak, and so I wrote the hardest e-mail I have ever written telling them the dog they had so carefully chosen as a suitable mate for Skeeter’s litter was now gone at a very young age and likely from brain cancer. I felt terrible about it on so many levels. A few days later I received a letter in the mail from Kathy & Carolyn. Having been in the “dog business” for as long as I had, I knew this could go very badly. But people can surprise you, and along with their sincere condolences, they offered me of one of Skeeter and Travis’ pups. I wondered how this could be, how they could be so generous, so understanding. I thought about their offer for a few days and made the call. The answer was YES, I wanted one and I wanted a boy. When the pups were 7 weeks old my good friend Jeannine Vieten and I made the trip to Kathy & Carolyn’s beautiful farm and training center in Tinmouth, VT. The pups were darling and there were two boys in particular that caught my eye. In the end I decided on a puppy we named ‘T” which was Travis’ nickname. Needless to say it was a very emotional day for all of us. I went to Vermont fully intending to pay for T because after all, Kathy & Carolyn had paid a stud fee in full for the breeding to Travis. It was only right that I buy the puppy. They refused to take payment for him and T has become the greatest gift anyone has ever given to us. He is now Ch. North Star Pebwin Crossroads JH WC and has made Skeeter, Travis, Kathy, Carolyn, Peter and me extremely proud. But more importantly, before he became the accomplished adult he is today, he filled our hearts with joy and eased the pain of Travis’ loss. Thank you Kathy & Carolyn for being there when we needed it most and for helping us to remember that goodness, human kindness and compassion exists. 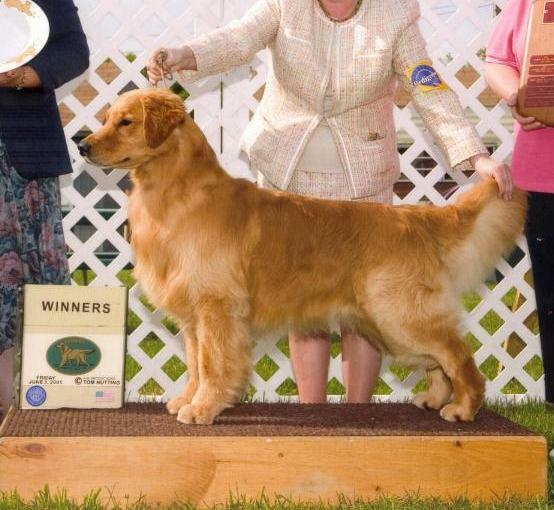 We will be forever grateful for your friendship and for your gift of T.
How fitting is it that someone like Berna, who has lived the glory and glitz of a Westminster championship, as well as the renown of a National Best of Breed championship, should write of a very generous kindness that moves her even now. 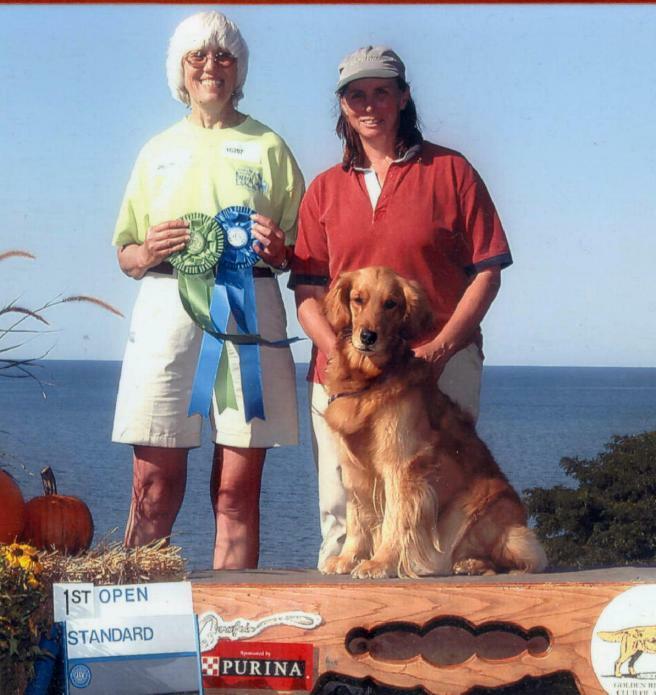 Her many Goldens and her friends like Kathy and Carolyn have kept her focus on what is most important in her life.. family, friendship, and helping other Golden owners. Thank you Berna for what you have written, all that you do for our favorite breed, and for taking even humble family pet breeders like Barb and I under your amazing wings.